To all the sewists who love to make bag projects, we have something special for you today! Make a unique hexagon patchwork bag with this free pattern and tutorial. 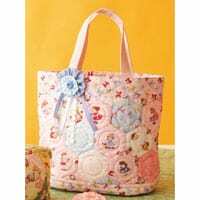 Check out this Quilted Tote Bag HERE. Hexagon Patchwork Bag FREE Sewing Pattern and Tutorial was there a clitch and can you repost it. I am going to make this. I have just completed a quilted tote without a pattern. Now I shall learn how it should be done!